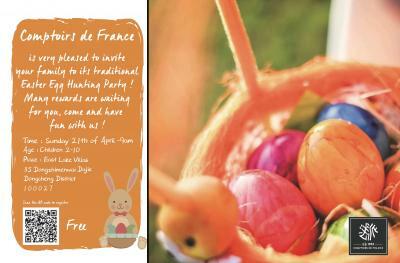 Comptoirs de France have produced many kinds of Easter products to sell in our shops and on our online platforms. From now until April 20th, buy any of our Easter products, and get a chance to participate in Comptoirs de France Easter Egg Hunt at East Lake Villa on Sunday April 21st ! For details on the event and how to win an invitation, please scan the QR code below.